They say necessity is the mother of invention. But survival is the mother of re-invention and the 1950's was the beginning of Hamilton's period of re-invention. If Hamilton watches were like people, the early 1950's would have been their "pre-teen" years... also known as "the ugly stage"... buck teeth, big ears, the works. Some watches from this era are more odd looking than others - but one thing is for sure, Hamilton designers were pulling out all the stops when it came to watch designs. Cases started to get funky lugs with ornate shapes and sometimes even the matching bracelets got into the game. 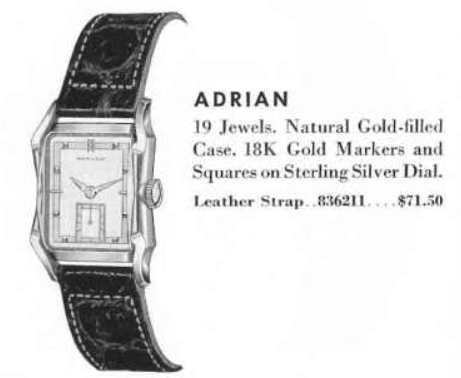 An example of this unique 1950's trend is the 1953 Adrian. Originally it came with a leather strap and looked fairly traditional but the case shape was starting to "bulge" a little here and there. Then in 1954, a bracelet was added and the watch seemed to take on an entirely different look... don't you think? 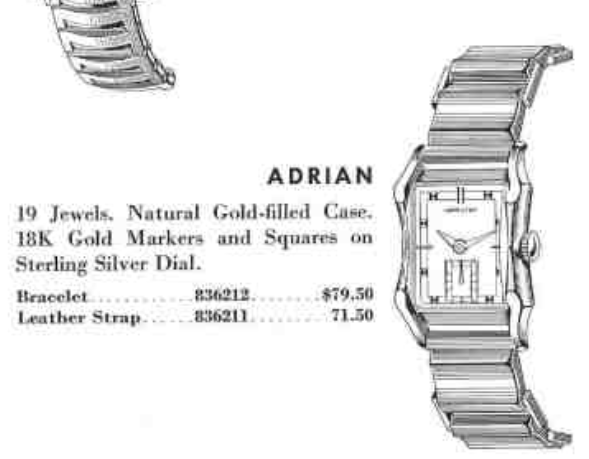 The Adrian was only available for two years and you don't see the model too often - at least relative to all the other models out there. It's an interesting model in that it came in a 10K gold filled case but had a 19 jewel movement inside. Normally 10K gold filled cases got 17 jewel grades and 14K gold filled got 19 jewel movements. But like I said, the early 1950's was an "awkward time" as the company was evolving. Tucked beneath the sterling silver dial with a two-tone white / butler finish is the 12/0 sized 19 jewel 753 movement. My Adrian project watch arrived in rough shape. It ran as good as it looked - and it looked like crap. I think this little watch had a long but tough life. With the bezel out of the way, the dial is definitely dirty but looks to be original. I'll see how it responds to being cleaned. Once the movement is removed from the case back, there's no difficulty identifying this model. The movement looks right and shiny in my photo but in reality it looks rather dirty. The center wheel and the third wheel are "stuck" in their train bridge jewels. That's from the oil inside turning to a gel. They'll pop out without much difficulty. Once a glass crystal gets scratched up like this there is really only one option for it... replacement. I clean parts in three steps... cleaner, rinse and rinse. Each step is a separate baby food jar in a water batch in my ultrasonic. You can see by the clarity of the cleaning solution that this movement was very dirty - it was clear when I put in the parts originally. While everything is being cleaned, I'll prep a new crystal for installation in the bezel. All the parts are now cleaned, dried and ready to be reassembled. The running movement goes on to the timer and the results reveal a little more effort is needed. It's running a bit too fast and the beat error is on the high side. A tweak to the regulator slows things down a bit but the beat error is still to high. I'll have to remove the balance and turn the hairspring collet on the balance staff to change the position of the impulse pin. Oops! It's supposed to get smaller. 6.4 milliseconds is the wrong direction. Alright, that's much better. Adjusting beat error like this is very tedious, and very risky so 1.4ms is more than acceptable. I often don't even both reducing it if it's less than 3.0 but the closer you can get to zero, the longer the watch will run on a full wind. The dial and hands get reinstalled. The case is a little beat up but its not heavily worn. The dial cleaned up nicely - it's not perfect but it's original and looks like it goes with the case. The new glass crystal and a fresh lizard strap make a HUGE difference. It actually looks a lot better than my camera makes it out to look. My camera can be brutally honest sometimes.